THIS PROJECT aims to investigate the development, land use and occupation of the site known as Grey Friars in Colchester. This area has a fascinating history, starting from Roman times, when the town wall was built. The idea for the project came from an overwhelming response by local people and tourists during the 2007 Heritage Open Weekend exhibition and tours organised to mark the closure of Colchester’s Adult Community College after 40 years at Grey Friars. Many people suggested that the wealth of information should be written up and made available to everybody. A book and this website are the outcome. ACCESS BOOKS is the publishing arm of the local education charity, LEARNING NEVER STOPS. It was set up following a bequest to the adult college made by a former student, E. Joan Gray (1925-2000). Joan attended courses at the college for several years and exemplified the Grey Friars ethos, having a genuine concern and interest in people and their welfare, development, communication and creative expression. Among its publications are a book about the adult college (with inspirational stories of its students and staff), creative writing by adult students, and a policy paper on the education of older people. THE CHARITY exists to advance the education of the adult population in Colchester and the surrounding area. It grew from community involvement in Grey Friars when it was an adult college. It achieves its charitable aims by various activities, assisting in the provision of resources for better access, by promoting education for all adults at all levels and by raising awareness. CALA is registered with the Charity Commission, number 1095713. THE CHARITY & THIS PROJECT: The project team and the charity have approached this ‘sharing heritage’ project according to the best community learning practice. In addition to the research undertaken by members, participation by all with an interest is welcomed and can be shared through presentations, exhibitions and lectures, as well as contributions through this website. LNS Committee and Trustees 2016: President – Sir Bob Russell; Chair – Jenny Jones; Treasurer – Sue Tye; Secretary – Joan Gurney; Archivist/Editor – Alan Skinner; Marion Williams. (Below, left) Founding Chairman, Alderman Janet Fulford, addresses the 2007 AGM; (right) local people and tourists flocked to the Heritage Open Weekend exhibition that sparked off this project. 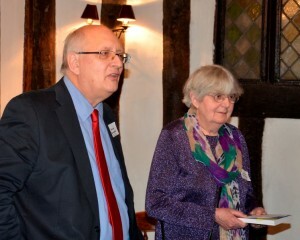 About the Project Leaders Neither Joan Gurney nor Alan Skinner is an academic historian, but they do have a passionate interest in local history and adult education. They are therefore delighted that their research on Grey Friars has fired local people’s imagination and has become an on-going community education project in its own right. Lectures on various themes are available – use the ‘contacts’ page or email access.books@btinternet.com – and everyone can participate through posts and conversations on this website. Joan has enjoyed a very long association with Grey Friars. She has lived in the Colchester area all her life, except for the years of study at university. She entered the Preparatory Department of CCHS in 1938, progressed through the Junior and Senior Departments, leaving in 1951. After training as a teacher, she taught in various local secondary schools, attending several evening classes at Grey Friars when it became the Adult Education Centre. In 1971 she transferred to adult education and became a Senior Tutor at the re-designated Adult Community College where she remained until 2003. She believes that her unusual combination of subject qualifications – biology, physical education, sociology, swimming teaching and, more recently, history of art – has given her a unique insight into the story of Grey Friars. She is also a compulsive collector, not only of early postcards, but of bathing bygones, of which her archive and expertise have national significance. Alan came to Colchester in 1983 to be the Principal at Grey Friars. Originally from London, with degrees from the University of Birmingham, the Open University and a teaching qualification from the University of London, he has had a varied career, most of it spent in education, 36 years of which were with Essex County Council. In 1980 he moved into adult education full time from his position as Head of the English Department in a comprehensive school. Having taught evening classes since his first teaching post in the 1960s he was well aware of the value of learning throughout life and became a strong campaigner for adult education, locally and nationally. As well as being at Grey Friars for 22 years, he has been a governor of local schools, chaired the original Colchester Learning Shop partnership and assisted local and national educational charities. In the year 2000 Birthday Honours, H.M. Queen Elizabeth II presented him with the MBE for services to education. With the help of local people who are willing to share their knowledge and materials, the project’s findings are constantly being topped up. See the ‘Resources’ section of this site. If you can provide any materials, memories, contacts and connections which add to the story of the Grey Friars site, please use the various links to contact us.